As a homeowner, you may wonder why so many people are requesting recycled Australian hardwood for their custom furniture needs today. They are doing so for a variety of reasons ranging from lower cost to it being better for the environment. Read the following facts to learn further details on the benefits of recycling local hardwoods into unique furniture creations. You will find that the recycled hardwood here in Australia is less expensive to include in your custom furniture pieces than new timber is in almost every case. Ideal for when you are trying to order unique items on a budget, and you will still be receiving high-quality materials at the same time. Some people mistakenly believe that they will have limited choices in recycled hardwoods for furniture, and as a result, they ask for new timber for the custom pieces. Do not fall into this trap since there is a wide assortment of recycled Australian hardwoods to choose from, including Messamate, Tasmanian Oak and Alpine Ash. When additional timber is necessary to complete a piece containing a recycled local hardwood, it is easy to do with timber from sustainable sources throughout the country. You can even match types of timber without much trouble. Since recycled hardwoods come from a vast assortment of sources, such as crates, construction timber, old pieces of furniture, flooring and other places, you will receive unique results for your bespoke furniture. Through turning to this type of wood, your results can provide you with unusual textures and colours along with additional character and ambiance. When high-quality workmanship comes with a custom piece of furniture that contains recycled hardwood, your furniture will last for years just as with new hardwood. Choosing recycled local hardwood for your bespoke pieces is beneficial to the environment. For one thing, fewer mature trees need harvesting when you do this. In addition, you keep the sources of this type of timber from winding up in landfills. To further explore the benefits of turning to recycled Australian hardwood for custom furniture, contact our company, Wenborn Wood. We promise high-quality furniture that is good for the planet and for you. 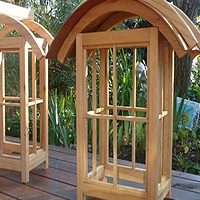 Our company provides adult beds, cabinets, tables, screens, boxes, lanterns and other items for use in your home. Let us be your eco-friendly source for bespoke furniture.